Unless you have a well stocked pantry at all times you may find yourself all out of distilled white vinegar when it comes time to clean the coffee maker. I know that many people go seemingly forever between coffee maker cleanings and when the bug strikes to get this task off your to-do list you want to take advantage of it. If however you only have apple cider vinegar on hand (or baking soda) please do your best to hold off until you can get to the store and buy a jug of regular old white vinegar. 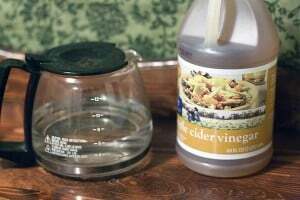 If you can’t wait then yes, you can use apple cider vinegar to clean your coffee maker. It works just fine. The only problem is it costs more to use and you will have to rinse your machine out a few extra cycles to get the taste out. According to Good Housekeeping, using a vinegar is one of the simplest way to clean a coffee maker. This will keep your coffee maker in good condition as well as deliver great tasting coffee all the time. Both distilled white vinegar and apple cider vinegar are acidic to the same 2.4-2.5 pH due to their 5% acetic acid content. The acid in both vinegars will clean and descale coffee maker heating elements and water lines exactly the same. The only difference is the distinct fruity flavor left behind by apple cider vinegar that will have to be flushed away with extra fresh water. Discard carafe content. Remove all contents of the carafe and rinse it with water. Make sure to empty the coffee filter and discard all coffee ground. Mix equal parts of water and vinegar. As a rule of thumb, fill half of the carafe with white vinegar and add water to make it full. Run a half brew cycle. Start a normal brew cycle and stop midway. Turn off the coffee maker. Allow the solution to sit in the carafe and the chamber for an hour. This will soften any calcified content and stain in your coffee maker. Finish the brew cycle. After an hour, turn on the coffee maker and complete the remaining brewing cycle. Empty the water-vinegar solution. Make sure to discard all of the water-vinegar solution. Run a fresh water cycle. Fill the water chamber with fresh water and run a full cycle. Let the coffee maker cool for a few minutes. Run another full water cycle. It will take about 2 to 3 full water cycles to remove the vinegar smell. Wash the carafe and filter basket. Prepare a hot soapy water and wash the carafe and filter. This will remove stain from the surfaces. Reassemble. Put all the parts together and enjoy a fresh, great tasting coffee again. Yes, you could clean your coffee maker with the apple cider variety. It has adequate acidic pH levels to get the job done but the tannins will leave behind a taste in your coffee maker than will not rinse off as quickly and easily as you’d like. Some people complain about the smell of white vinegar in their home but this is easy to dissipate and rinse from your machine. Apple cider vinegar will leave a lingering taste that will make your coffee a bit under-performing for some time. Make sure you run a water and vinegar cycle through your coffee machine just like you normally would. I like to use a 50/50 ratio for the first run and then if I do more runs I pull back a bit. The trick to getting the smell and taste out is to run a lot more plain water cycles to rinse your system. With plain vinegar it’s easier to get back to a “blank” taste but it will take longer if you use apple cider vinegar. Every now and then I like to pull out my favorite french press coffee maker and soak the fine mesh plunger in the same apple cider vinegar solution. It does a good job and keeping those tiny holes clean. On a related note you can check out this post for another good way of cleaning your coffee maker when you don’t have white vinegar on hand. It takes a lot of lemons though – be forewarned. There are many easy ways to clean the coffee maker. This refers to every day cleaning or every time you use the coffee maker. This refers to a scheduled procedure when the coffee maker undergoes a complete cleaning. Use Baking Soda – You can also use baking soda when cleaning your coffee maker although you do have to be careful using this method. The process is similar to using vinegar. Mix baking soda with lukewarm water. Always use lukewarm water to completely dissolve the baking soda. Pour the baking soda solution inside the water chamber. Press the brew button and run a full brewing cycle. Throw away the water. To wash the coffee maker, fill the water chamber with full brewing cycle. Run a full brew. Watch if the water is clear or not. Often, it will take two full brewing cycle to completely wash off the baking soda solution. Use Vinegar and Salt – Mix water, vinegar and add some salt. Salt is a natural antibacterial. By adding salt, it will help you disinfect the coffee maker especially if mold and mildew had grown in the tube the carries the water from the chamber to the filter. Denture Tablets – Many coffee maker owners agree that denture tablets are great cleaners. It helps remove calcified content and freshens up the coffee maker to deliver great tasting coffee, like a new coffee maker. Fill the carafe with water. Dissolve 1 or 2 denture tablets. You can use even generic denture tablets. Pour the denture tablet solution in the water chamber. Run a full brewing cycle. Discard the used water. Fill the water chamber again and run a full brewing cycle to wash off any remaining solution. Unlike vinegar and baking soda, you only need one full brewing cycle wash to clean up the coffee maker. There are also a few more options listed on this page. Cleaning your coffee maker regular will prolong its quality. Here are three simple reminders to keep your coffee maker in tiptop shape. Additional Tip: If you don’t want to use vinegar, you can choose a healthier alternative – lemon juice. Lemon juice has a natural cleaning agent that helps manage stains. You don’t really need to buy a new coffee maker when you feel like the coffee you are getting does not taste as good as before. All you need to do is first check your coffee maker and ensure that all of its parts are clean. If you see any signs of calcification or white build up, act fast. Use any of the deep cleaning methods mentioned here to ensure that your coffee maker works well. Are Dedicated Coffee Maker Descalers Better Than Vinegar? Yes, obviously the acidic properties of vinegar can clean the crud out of a coffee pot but in the real world you have to do this a lot to keep things as clean as possible. The best way to keep a coffee maker clean is to use a dedicated appliance cleaner designed to break up all the calcium and mineral deposits. If you are using un-filtered water, especially water from a well, you may end up with larger particle debris clogging up your system. There is a very inexpensive product called CleanCaf that you can pick up which will be better at descaling your machine but it is also formulated to cut through the coffee oils that buildup over time. These oils are the weak spot with vinegar as vinegar doesn’t clean coffee oils up very well. CleanCaf isn’t the only option either. There are a few other options listed here. One last shout out – I am working on a series of posts on super automatic espresso makers. If you have any questions about them please hit me up. I’m digging for post ideas. Thanks!